The antibacterial and anticancerous properties of EMTAHDCA have already been reported in our previous study. However, mode of action of EMTAHDCA is still elusive. The present study was aimed to investigate the molecular targets in Escherichia coli and spleen of lymphoma-bearing mice in response to cyanocompound 9-ethyliminomethyl-12 (morpholin-4-ylmethoxy)-5, 8, 13, 16-tetraaza -hexacene-2, 3- dicarboxylic acid (EMTAHDCA) isolated from fresh water cyanobacterium Nostoc sp. MGL001. Differential expressions of proteins were observed in both E. coli and spleen of lymphoma-bearing mice after EMTAHDCA treatment. In continuation of our previous study, the present study revealed that the antibacterial agent, EMTAHDCA causes the drastic reduction in synthesis of proteins related to replication, transcription, translation and transportation in E. coli. Probably the direct or indirect interaction of this compound with these important metabolic processes led to the reduction in growth and cell death. Furthermore, the anticancerous property of the compound EMTAHDCA reflected as down regulation in proteins of cell cycle, cellular metabolism, signalling, transcription and transport together with up regulation of apoptosis, DNA damage and immunoprotection related proteins in spleen of lymphoma-bearing mice. 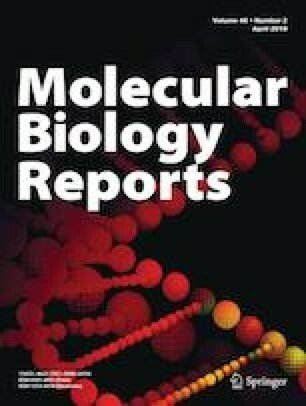 In this study the EMTAHDCA induced modulations in expression of proteins of key metabolic pathways in E. coli and spleen cells of lymphoma bearing mice helped in understanding the mechanism underlying the antibacterial and anti-cancerous property. The Head, Department of Botany, Banaras Hindu University, Varanasi, India is gratefully acknowledged for providing laboratory facilities. Ekta Verma is thankful to the UGC, New Delhi, Balkrishna Tiwari and Sindhunath Chakraborty are thankful to the ICAR AMAAS, New Delhi and Shashank Kumar Maurya is thankful to CSIR, New Delhi for financial support in the form of SRF. Funding was provided by University Grants Commission (Grant Nos. Rajiv Gandhi National Fellowship-JRF and UGC-JRF), Council of Scientific and Industrial Research (Grant No. SRF), National Bureau of Agriculturally Important Microorganisms (Grant No. SRF). All the authors declare that they don’t have any conflict of interest. All the experiments were approved by the Animal Ethical Committee of Institute of Science, Banaras Hindu University, Varanasi 221005, India. IAE No. 1802/GO/RE/S/15/CPSEA.